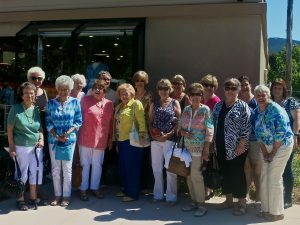 A General Meeting and luncheon is held the last Wednesday of each month, September through June, at the San Vicente Resort, 24157 San Vicente Road, Ramona. The luncheon is open to the public, with members and guests encouraged to make a reservation at the San Vicente Resort front desk by the Friday before the meeting. The cost is $15.00. If you have made a reservation and must cancel, please call Kaaren Thiem at 760-788-4840 or contact her at kaarengreg@cox.net. Kaaren also has membership information. The San Vicente Valley Club is welcoming prospective members on February 26, 2019 from 5:30 – 7:30 PM at the home of Kaaren Thiem, our membership chair. We’ll serve plenty of wine and lots of heavy hors d’oeuvres. The San Vicente Valley Club is a charitable and social association. Our charitable giving includes scholarships to outstanding graduating high school seniors and grants to deserving community organizations. But we also like to have fun playing Scrabble, having breakfast with the book club or going to plays at the Scripps Ranch Theatre. We meet the last Wednesday of every month to have lunch, socialize and listen to a scintillating program. In February, representatives from Ramona CAL FIRE will help us to prepare for emergencies. March is a must with Juliana Stewart director of the “Out of the Box Theatre” giving us a taste of her talents. And this is just a sampling. Start by joining us for our Meet and Greet at Kaaren’s home. Get to know some of the officers and current members. You’ll have fun, get to increase your social circle, have some stimulating conversations and get to be part of something important and worthwhile. For directions to Kaaren’s home call her at 760-788-4840. Please RSVP by February 21 if you’ll be there. Residents of Ramona, Julian, Santa Isabel (and actually, where ever you live) are welcome! 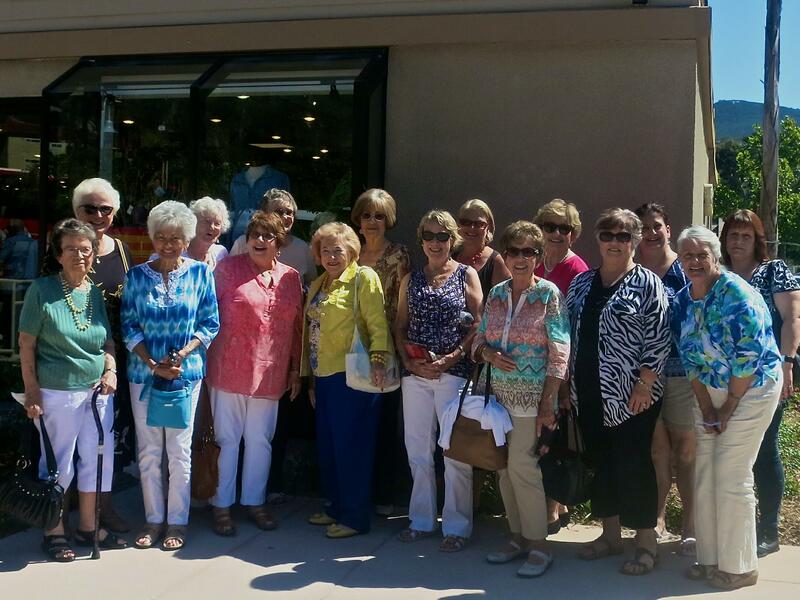 We are a delightful mix of women who enjoy our lives, want to give back and are thankful that we found this group. Grab yer boots and cowboy hats! Scoot on over to the San Vicente Resort for a BBQ buffet, dancing and hometown fun. 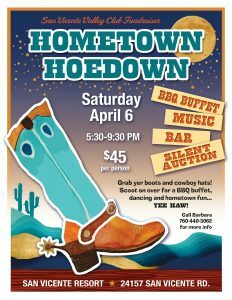 The Hometown Hoedown will be on Saturday, April 6 from 5:30 – 9:30 PM. The cost is $45 per cowhand. 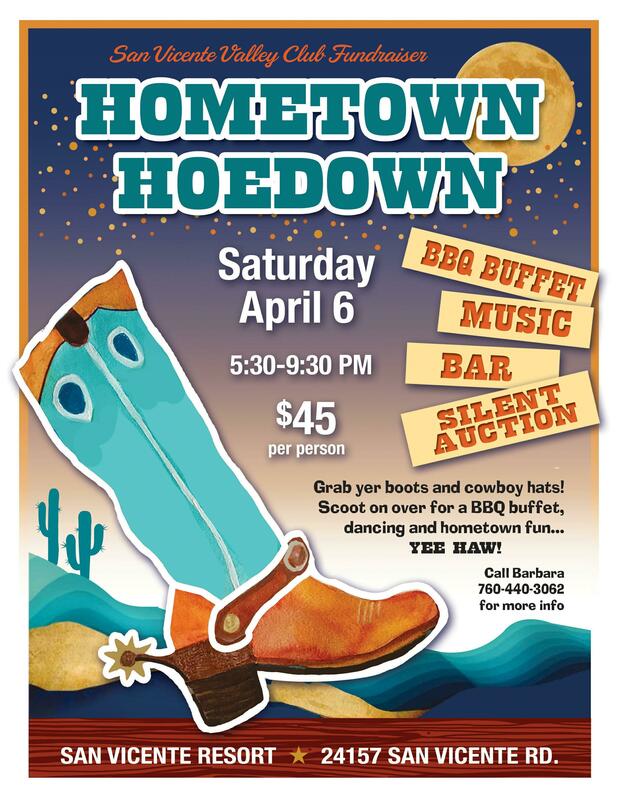 Enjoy country western music, a cash bar and a fantastic, fabulous silent auction. Or pop a balloon for a fun prize! But be sure to have fun or you just might end up in our hometown jail. For more information or to buy tickets, call Barbara at 760-440-3062. Have you visited our Interest Groups? Find a new interest and meet some of our members. All the current news about our Library can be found at the Friends new website: http://friendsoframonalibrary.org and by reading the Friends newsletter, The Friendly Wave, posted on the site.